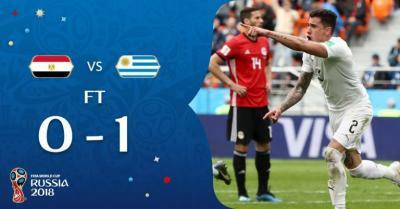 World Cup: Egypt 0 – 1 Uruguay (Watch Highlights) 3GP MP4 Download. Luis Suarez missed several chances for Uruguay in their World Cup opener, but Jose Gimenez’s header defeated Egypt. Jose Gimenez spared the blushes of Uruguay’s all-star forwards with a 90th-minute winner to see off Egypt 1-0 in their World Cup opener. After the excitement of Group A rivals Russia’s goal frenzy a day earlier, there was a serious lack of invention on show in Ekaterinburg. Suarez missed two golden opportunities as goalkeeper Mohamed El-Shenawy excelled, before Cavani struck the post with a late free-kick, seemingly sealing a point for Egypt on their return to the finals. Egypt offered little in Salah’s absence and are now under pressure heading into a clash with Russia, while Uruguay – and particularly Suarez – can breathe a sigh of relief. With Salah – who has been battling a shoulder injury – watching on from the sidelines, Egypt’s approach was largely compact and somewhat rugged and the first chance came as Cavani worked El-Shenawy from 20 yards. Uruguay continued to labour in the attacking third before the break, while a healthy Egyptian contingent had only Salah’s appearance on the stadium’s big screen to cheer. And El-Shenawy again looked to have preserved a point with a sublime save from Cavani’s thunderous volley, before the Uruguay attacker curled a free-kick against the post.